There are a few places on this planet that everyone knows about, but yet only few people have ever been to. The Amazon is certainly one of those places. It was also true for me. I have flown over it countless times and seen all sorts of National Geographic articles and documentaries about the Amazon. So I decided that it was time to finally visit it myself. One of the most important questions for any animal photography trip is when to go. I learned soon enough that there are really two main seasons, wet and very wet. The former being referred to as the dry season and the latter as the flood season. What it really means is that during the flood season, there are areas of the Amazon, the várzea forests, that are completely flooded. No dry land anywhere. Those areas have a bit less dense vegetation than the terra firme forests. While that is less impressive than the dense jungles, it makes it easier to see animals. Given all this, I knew where to go. As for the when, I had no choice. This was an add-on to a business trip and so I had to go during the height of the hot season. The place I chose to go to had some of the best reviews and is also a community run project. All the profits stay local and give the local population more incentive to protect the flora and fauna. All the more reason to support them. The Uacari Floating Lodge is about 1.5 hrs by boat from the next airport in the city of Tefé. That again is 1 hr upriver by plane from Manaus, itself not really the center of the universe. All that translates to remoteness, quietness and lack of cell phone signal (yay!!). As mentioned above, this area is completely flooded for part of the year. Therefore all buildings are either on tall posts or are floating structures. The lodge is an assembly of several floats located at a quiet river bend. Five floats with two rooms each and a central dining and bar area along with staff quarters make up the lodge. It is simple, but functional and beautiful. I should also mention that all the electricity is generated by solar power and thus there is no AC. However, the evening thunderstorm and the ceiling fan help to cool things down to a comfortable level. The days where divided into 3 activities, nicely interrupted by an abundance of fresh local food. The mornings being a bit cooler where mostly used for hikes in the forrest. Local guides with an incredible skill at finding the local fauna and explaining how the forrest is used made that the best part of the trip. Lunch was followed by a nice siesta to pass the heat of the day. The afternoons usually had a boat trip to make use of the cooling water. Those trips ranged from fishing for piranha, watching the dolphins, canoeing and bird watching. Finally, after dinner (there was tea time, too) the staff or local scientists would do a presentation about the area, the various animals etc. The bar then served a nice nightcap. One cannot talk about the Amazon without first admiring the Amazon river. At this location, upriver from Manaus, it is not yet called the Amazon river. The lodge is located at the confluence of the Solimões and Japurá Rivers. The vast expanse of the rivers is an amazing sight. The rivers also harbor some unique wildlife not found anywhere else on the planet. The largest scaled fish alive, the Pirarucu or Arapaima, is a constant sight during the dry season. Their splashing is heard all day and night and is a soothing background noise. Two species of fresh water dolphins live here as well. The Tucuxi, which looks more like a “regular” dolphin, and the Pink River dolphin or Boto, which is more like a cross between a beluga whale and a sun-burned dolphin. They are not easy to photograph, but a lot of fun to watch. Now is the time to step off the boat. This time of the year, there is plenty of dry land. Owing to the fact that the forest is submerged for several months every year, there is not a lot of underbrush as one would find in a dry or terra firme jungle. That makes for very comfortable hiking and also makes it easier to spot animals. The trees and vegetation that does exist, though, is uniquely adapted to the flooding. They grow very fast and develop an amazing root system. I do have to mention one downside of this fauna, though. Everything lives on top of the trees. My neck is still sour from looking up the whole time and holding up a heavy lens to capture it all. The first thing you will hear while walking through the forest are the monkeys. Specifically, the Howler Monkeys. The little audio sample below is from one of the hikes. At about 1 min, the monkeys come out in strength. There are five types of monkeys in this area that one will commonly come across during the hikes. The Howler Moneys as heard first and foremost. Then there are two types of Squirrel Monkeys. These are the smallest ones. A bit larger are the Capuchin Monkeys. Finally, the very shy Uacari Monkeys after which the lodge is named. They are also the most interesting ones. Long white fur paired with a bright red face. Unlike the other Monkeys, the Uacaris really do not like people. As soon as they realize that they have been spotted, they take off, making photographing them a lesson in patience. I do have one fun side story. There are a couple photos of Squirrel Monkeys with an Iguana. Those monkeys always move in a huge group. As it happened the only branch connecting two trees was already occupied by an Iguana. So monkey after monkey happily ran along until they suddenly spotted the reptile and froze. That was followed by a panicked look and lots of head-scratching to decide wether to turn around or brave the monster. In the end they all made it across, but it was clear they did not trust the Iguana. The animal that the Amazon holds in abundance is birds. Everything from water fowls, to parrots, to birds of prey. This place is simply heaven for any bird lover out there. For me it was special as well as I always wanted to see Macaws in their natural habitat. And in that I was lucky. The other bird I really wanted to see are Tucans. Fortunately there is not shortage of those funny birds. With all those animals I had to think for while to decide which one was actually my favorite of them all. In the end, I decided for the Sloths. They just simply seem to be always happy with a big smile on their face. We even lucked out and saw a two-toed sloth, which is rather rare. This one week in the Amazon was an amazing experience. But I am not quite done with this area of the world. There is still one animal I have to see and that is the Jaguar. However, during the dry season it is almost impossible to see them. During the flood season on the other hand, they retreat to a couple specific tree types, making them much easier to find. So there is one more trip in it for me. All in all, I can only highly recommend this trip. One week will provide plenty of opportunities to spot some unique and endangered animals. 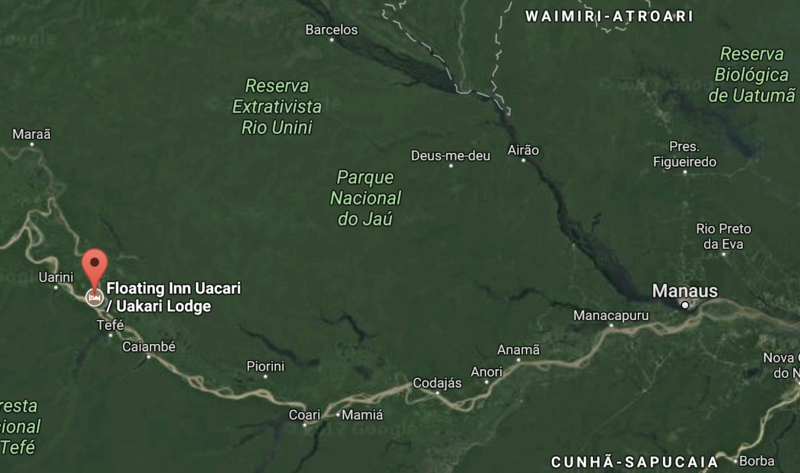 The Uacari lodge is a perfect base to run the expedition from. They offer a “photography package” which really consists of a private guide and a boat available at any time. That is truly the way to go as the smaller group will scare the animals less and no-one is annoyed at the photographer taking an inordinate amount of time to capture the right images. Jessica and Marildo, my guide and spotter, where amazing in showing me the splendor of the Amazon forest and its inhabitants. They explained how all the different plants are used locally and patiently waited until I got all photos I wanted. Thank you for a wonderful trip. Mutio obrigado!